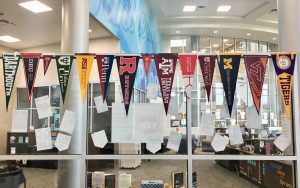 One of my favorite parts of working in a high school library is helping students figure out what they want to do with their lives–what do they want to be, where do they want to go to college, or, if not college, what are their plans after high school? 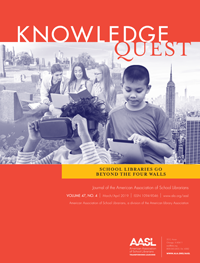 I realize I am no college counselor and I do not try to be; however, what is important to me is providing resources for students to help them answer those questions. I think back on when I was in high school and what kind of guidance was provided for me in figuring out my educational and career path…very little. My father wanted me to move to New York, take acting classes, and become a Broadway actress (he was a physician). Luckily, I was the kind of kid who went to Barnes & Noble to buy one of those really big books with summaries about all the different colleges and universities in attempts to determine my future. However, not every high school student will be so proactive and may be unaware of where to look for information. 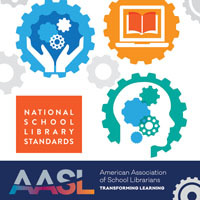 My high school library did not have a college reference book like the one I had to go out and purchase, nor did they have any other college materials that I can recall. The counselors office did have some materials, but the office was always busy and there was little time in the day to visit. 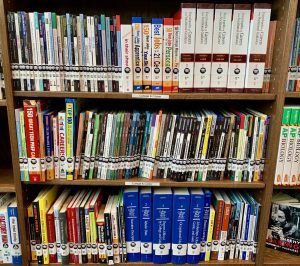 Likewise, my students seem to only visit the counselor’s office for a specific reason, therefore having college materials in the library where students frequent and hang out made much more sense. At the beginning of each year, we appeal to college admissions offices to send us materials for student distribution. We email colleges all over the country in hopes of exposing students to a wide variety of schools and locations. While there will always be the kids who only set their eyes on in-state schools, I want students to realize there are great schools in every state and they may find a perfect fit beyond state lines. 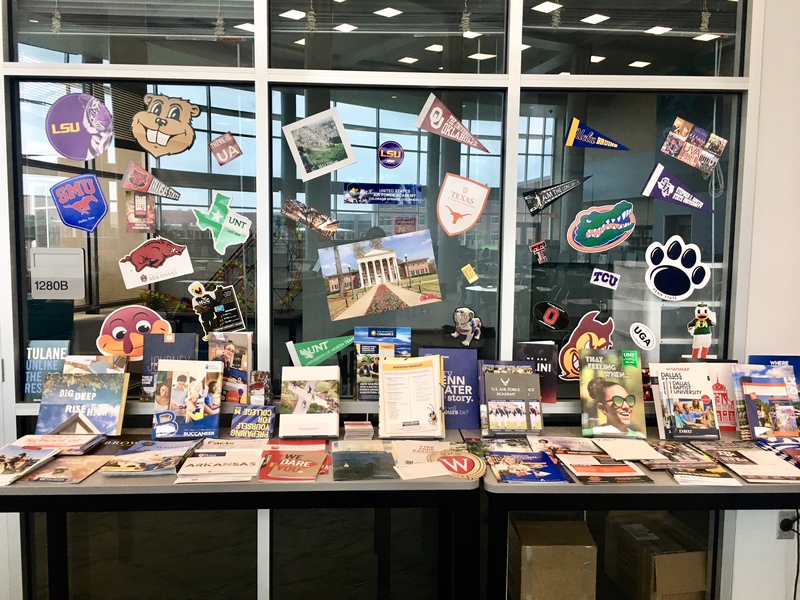 We display the promotional materials on a large table in the library for students to explore and take; we also hang up any pennants and posters the colleges provide. 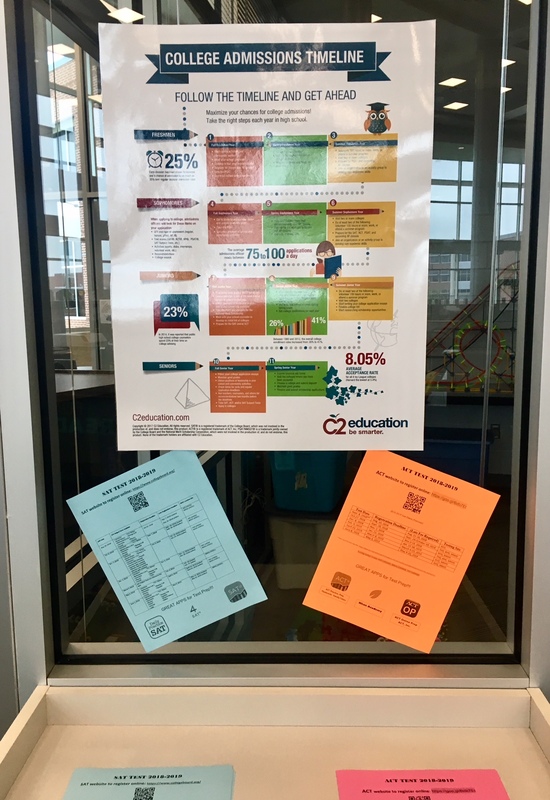 Next to the college table, we have a poster with a college admissions timeline from C2 Education (a company that offers tutoring for standardized testing), which suggests steps for students to take to prepare for freshman year. We also provide flyers with SAT and ACT information, dates for the exams and apps for test prep. 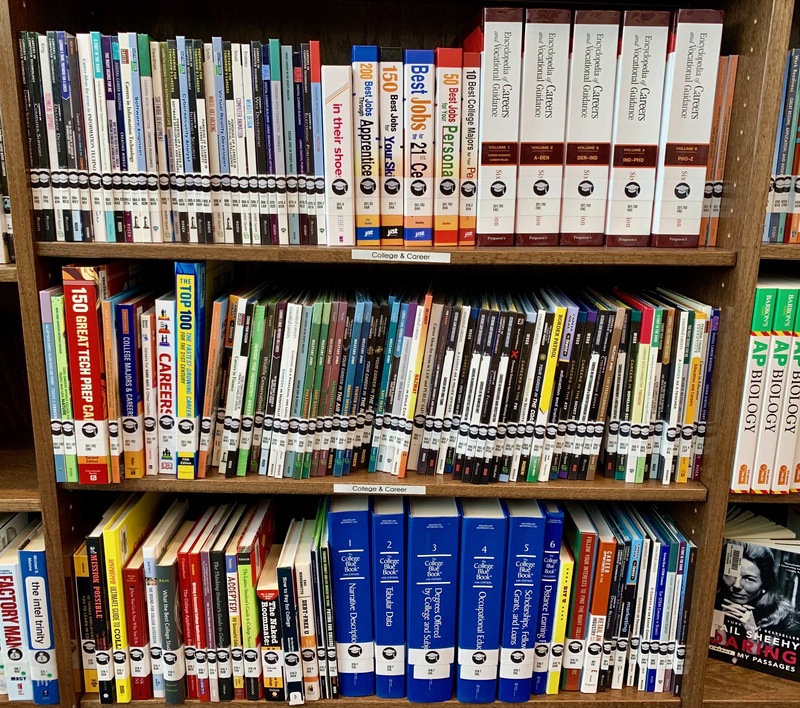 In addition to the college materials that rotate, we have a college and career section of books and reference resources. Our collection includes books about finding the right college and materials about different majors and careers; it also includes information on how to find the best career for you and the path to achieve a specific career and materials on technical careers and careers that do not require college, as well as resources on how to pay for college and information on financial aid. 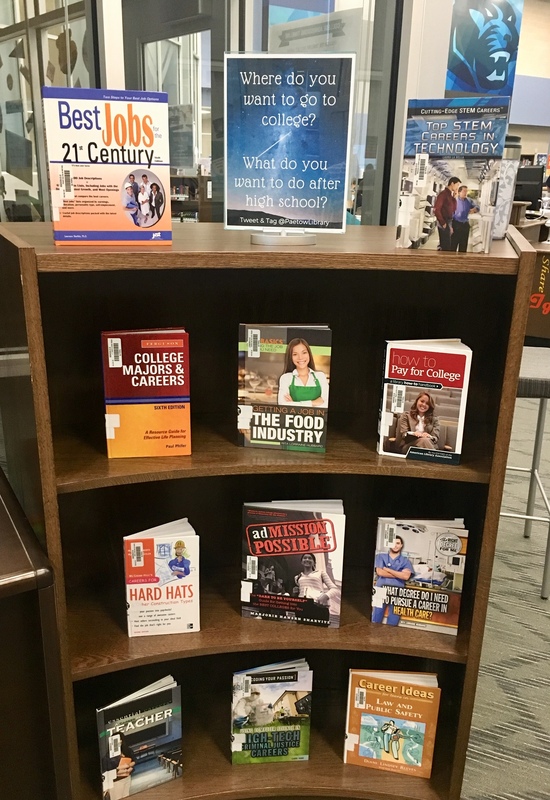 Students find these resources beneficial since they are able to explore a variety of careers and read about the college and career requirements. 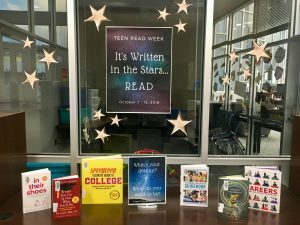 Every now and then we will create a display to promote these resources to make students aware they are available; for instance, this fall during Teen Read Week we took advantage of the theme “It’s Written in the Stars…Read!” to promote students’ destinies and what is written in the stars for them. We displayed books about colleges and different careers to encourage them to start thinking about their futures. 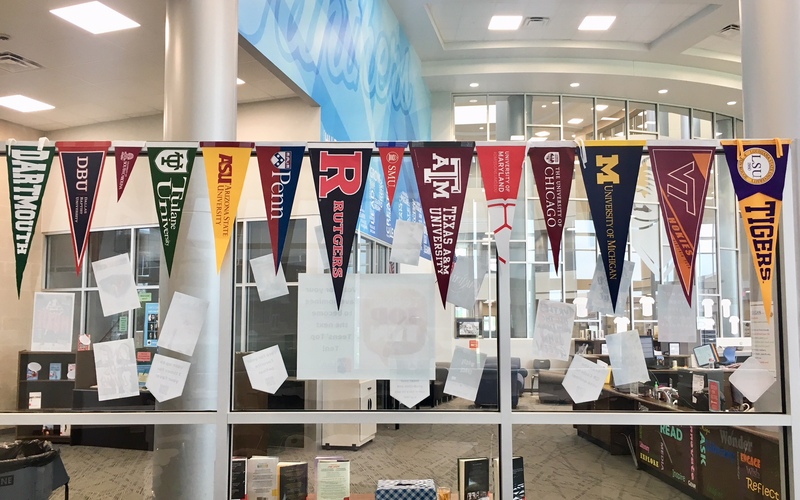 Additionally, we make sure to promote the district college and career night in which students have an opportunity to meet with college representatives. Throughout the year we hold lunch n’ learns in the library in which different speakers come in to informally speak to students about their careers and their career paths. We have hosted lawyers, fire chiefs, EMTs, state troopers, a criminal intelligence analyst, even our own principal! 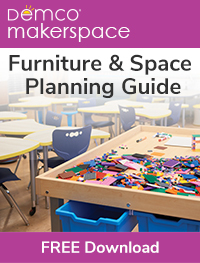 This is a great way for students to make real-world connections and talk with someone about their career path and what the job truly entails. 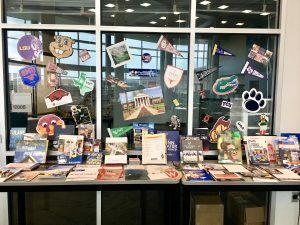 Finally, the school library website includes a “College/Career” page that includes links to College Xpress, which helps students find scholarships and colleges that fit them, as well as an SAT word of the day provided by College Xpress, Merriam Webste,r and Magoosh (an online test prep service for college and graduate school). There are also links to BestCollege.com, FAFSA, and other helpful resources. 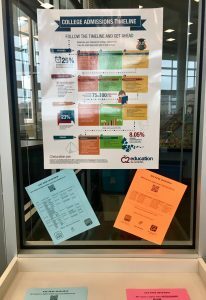 We work closely with the counselors office, sharing resources and promoting events to support all students. We live in era where young people can achieve almost anything they set their minds to, and I believe it is worthwhile to support their dreams with the resources to help them get there.